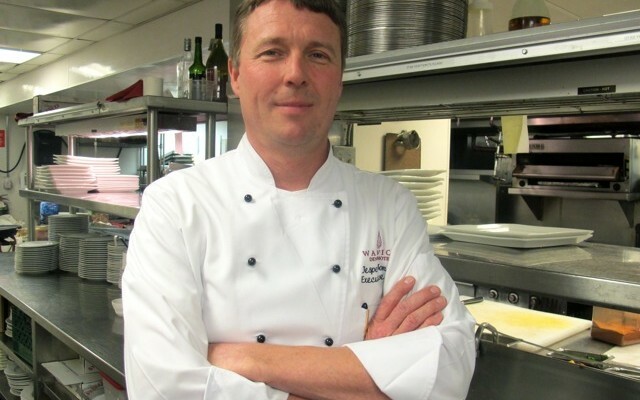 Jesper Jonsson, Chef Educator at Auguste Escoffier School of Culinary Arts in Boulder, will be the headliner for the 2015 Edesia: A Palisade Culinary, Wine & Spirits Adventure on Sunday, March 29, at Wine Country Inn. Recently inducted as an Escoffier Disciple, the background and training of Chef Jesper Jonsson make him a natural leader for the team of Celebrity Chefs who will demonstrate their culinary skills at Edesia, Palisade’s Culinary, Wine & Spirits Adventure this year. Before joining the Escoffier educator staff in Boulder, Jonsson was Executive Chef at Randolph’s, at the Warwick Denver Hotel. “We are excited to have Chef Jonsson spearhead our culinary activities this year,” says Jack Ballenger, Food & Beverage Manager for Wine Country Inn. A native of Denmark, Jonsson trained in France at both Universite Paul Valery and Auguste Escoffier. With a solid background in French cuisine, he moved on to cook in Europe, New York and eventually in Colorado for clients that have includedDanish diplomats, royalty, heads of state, captains of industry and a variety of film and sports celebrities. His guest lists have named such luminaries as Princesses Stephanie and Caroline of Monaco, Caroline Kennedy, Yoko Ono, Isabella Rossellini, Clint Eastwood, Roger Moore and Greg Norman, to name a few. Jonsson speaks English, Danish and French and if in a pinch, he can handle Italian as well. With all his exposure, Jonsson is a down-to earth chef who takes pride in culinary simplicity, knowledge and perfect execution of his food. He has a love for Colorado game and meats and insists that Colorado lamb is absolutely equal to the best pres de sel from Brittany, France. He comes by his love for Colorado from having lived and worked on the Western Slope as well as owning a popular restaurant in Meeker. Joining Jonsson are Josh Niernberg, Executive Chef/Owner, Bin 707 Foodbar, Grand Junction; Graham Mitchell, Executive Chef, Auguste Escoffier School of Culinary Arts, Boulder and Tronette Alexander, Pastry Chef, Wine Country Inn. Tickets for the VIP Luncheon, from 11 a.m. to 1 p.m., cost $125 per person, are limited and will be sold on a first come, first reserved basis, either online or in person at the Inn. The VIP ticket also will admit a guest to the main event from 1 to 5 p.m. that afternoon. General admission tickets for Edesia, which will be hosted from 1 to 5 p.m., on Sunday, March 29, cost $75 per person and can be purchased online at www.edesiapalisade.com, on Grand Valley Magazine’s website – www.gvcatalog.com or in person at Wine Country Inn in Palisade. Vendors are encouraged to register as soon as possible as booth space is limited. For more information, call 970-464-5777. Edesia, which benefits Marillac Clinic, is named for the Roman Goddess of fine food and drink. Alpine Bank is the presenting sponsor, while Remy Martin, the French champagne and spirits giant, is principal title sponsor. Other major sponsors include the Grand Junction Free Press, KKCO 11 News, Magic 93.1, The Vault 100.7, Grand Valley Magazine, Shamrock Foods, FCI Constructors, Absolute Prestige Limousine Service, Peczuh Printing, Dalby Wendland, Suzi Productions, Eagle River Associates, the Town of Palisade, the Palisade Chamber of Commerce and Wine Country Inn.